I’m pleased to announce that the second iteration of tiltedsquare.com is now up and running. The business has been growing a lot lately, and I’m taking on more web design projects. To reflect this growth and new direction, it was time for a facelift. The new site has a ton of great features both in the front end and backend. With the newest version of tiltedsquare.com, it was very important for me to develop a site that was responsive and functioned flawlessly on every device from smartphones to desktops. Have a look yourself – resize your browser window or pull out your smartphone and see how it adapts to the screen size. With more and more users accessing the web from their phones, it is increasingly important to have a site that works just as well on a small screen as it does on desktops. Along with building a responsive website, many other enhancements were made as well. Revamped portfolio section featuring large images and easy navigation between projects. Featured client testimonial slider with a simple to manage backend system. 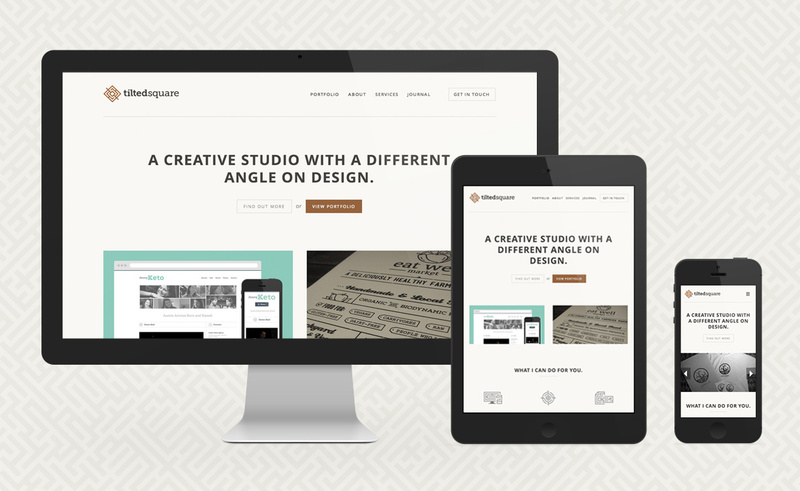 Portfolio slider for screen sizes under 780px. This was a strategic move to save space on the homepage on devices with smaller screens. Custom designed icon fonts for all icons across the website. Unlike images, icon fonts scale perfectly when zoomed in. Easy to use Project Planner for prospective clients. Subtle css effects like page-load fade-ins and hover animations. Main headings are set in Effra, with sub-headings using Museo Slab, which is also the font used in the Tilted Square logo. All fonts are served by Typekit. The site is built upon WordPress, which is a powerful content management system. Developed upon my custom built framework, SquareOne. I’m very satisfied with the site’s outcome, although, I do plan to continually make subtle enhancements as time goes on. I’ll also be adding some more work to my portfolio, so check back soon.